Disney announced strong second quarter results for fiscal year 2018, topping Wall Street expectations. The entertainment giant reported a 9% year-on-year quarterly revenue increase, while earnings per share jumped 23%. This growth was fueled by its Parks division and Studio Entertainment segment, in particular the success of blockbuster movies such as Marvel’s ‘Black Panther’ and ‘Avengers: Infinity War’. Disney’s Studio Entertainment is set to keep the blockbuster titles coming over the next few years, which will be of vital importance when Disney launches its direct-to-consumer offering in 2019. The company’s cable segment, which includes ESPN, saw operating income drop 6%, partly due to costs associated with the new streaming service ESPN Plus. Although Disney has recorded its strongest growth in two years, the focus is on the potential bidding war between Comcast and Disney for the Fox entertainment assets. Last year, Disney agreed to acquire Fox’s entertainment assets for $52.4bn ($66.1bn including debt). However, Comcast has recently said that it will make an all-cash bid for the same assets “at a premium to the value of the current all-share offer from Disney”. Disney CEO, Bob Iger, remains confident about the acquisition of the Fox assets, but many see a bidding war on the cards between the two companies. Fox shareholders will vote on July 10 on the proposed acquisition – Disney shareholders will also meet on the same date. 21st Century Fox delivered mixed results in the fiscal third quarter, falling short of Wall Street expectations. Fox earned 49 cents per share with $7.42bn in revenues, below analyst expectations of 53 cents per share and $7.44bn revenues. Although revenue and operating income shrank for the television and filmed entertainment segments compared to the quarter last year, Fox’s cable network programming segment recorded its highest ever fiscal third quarter earnings. The cable segment delivered 16% growth with an operating income of $1.68bn, driven by double-digit growth in domestic affiliate revenue. The television segment saw operating income decline from $112m to $78m, largely due to the absence of ad revenue from the Super Bowl. Filmed entertainment operating income declined 23% from $373m reported in the prior year quarter to $286m. 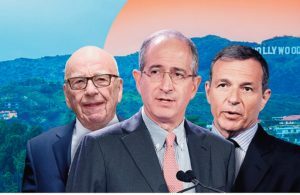 Fox remains caught up in its bid to buy the 61% stake in Sky that it doesn’t own; Comcast disrupt the Disney/ Fox deal. It is important to highlight that before Fox and Disney shareholders meet on July 10, the US Department of Justice will give a verdict on the AT&T and Time Warner merger on June 12. 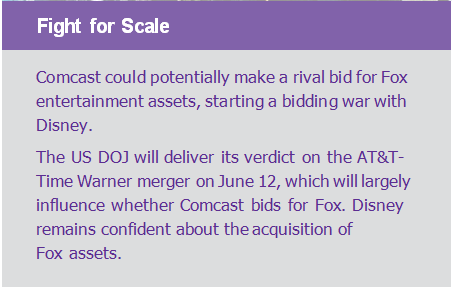 This will set the scene for the rest of the media industry and Comcast has indicated this is very likely to influence its bid for Fox. Comcast delivered strong performance, but its video subscriber base continued its downward trend, with a loss of 96,000 in Q1. The company’s first quarter 2018 adjusted earnings per share were up 17% year-on-year at 62 cents, while revenues increased 10.7% year-on-year to $22.79bn. NBCUniversal was largely responsible for the better-than-expected performance, reporting 21% growth in cable revenues, largely due to the Olympics and Super Bowl. The company’s stock is down 20% since the start of 2018 due to the bid for Sky and potential bid for Fox; Comcast would substantially increase its debt from $65bn to around $164bn, giving the company the heaviest debt burden of any company (excluding financial and government-related companies). Discovery recorded lower earnings in the first quarter 2018 following its $13bn merger with Scripps Network. The acquisition boosted sales, but the increased costs associated with the deal significantly impacted profits. Sales were up by 43% year-on-year from $1.61bn to $2.3bn, while net income was down from $221m last year to $3m. Nevertheless, executives remain upbeat about future growth as the merger will have a mixed impact in the short-term – the extra sales base will boost revenues while the associated costs of the merger will drag on profits throughout 2018. Overall, it’s a mixed bag of results for major broadcasters and media companies and highlights the strategic importance of premium content. Major broadcasters and media companies continue to address the challenges of ‘cord-cutting’ and increased competition. This has put pressure on margins, as companies attempt to differentiate their linear offerings and find the scale needed to compete with big-budget tech companies. Netflix surpassed Disney and Comcast in market capitalization recently, becoming the world’s most valuable media and entertainment company. The company’s shares hit an all-time high propelling its market capitalization to nearly $153bn. 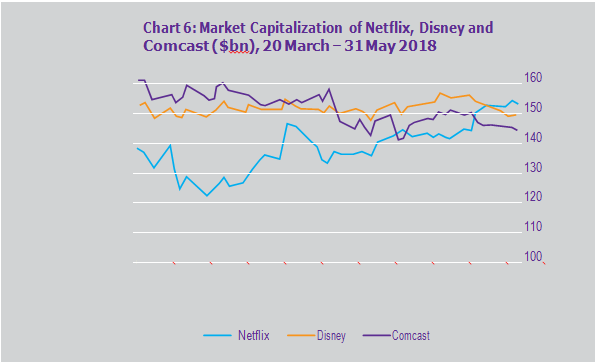 At the time of writing, the market capitalization of Netflix ($152.8bn) remains above Disney ($148.6bn) and Comcast ($143.8bn). Although many have claimed that Netflix has become ‘bigger’ than Disney, this is not necessarily the case – Disney is expected to generate four times as much revenue as Netflix this year and is also more profitable. Netflix has experienced significant growth with shares up 143% over the past year. Much of last year, Netflix beat expectations of subscriber growth, which has led the company to more than double its market cap in the last 12 months – Netflix ended last quarter with 125m subscribers worldwide. There are several reasons why Netflix’s market cap has achieved this growth, some of which are discussed below. Investors have been willing to pay a premium for Netflix stock as it is expected to generate much better growth than Disney. Netflix has proved that investment in original content is paying off. It is also seen as a promising player in the new media environment, as consumers are increasingly choosing streaming services over traditional TV. Also, the price hike for subscribers last year has not discouraged growth. Moreover, Netflix has a first-mover advantage. Although, traditional broadcasters and media companies have recently focused on launching their own streaming services – Disney has launched streaming service ESPN+ and plans to launch a Disney-branded service in 2019 – it will take a considerable amount of time to match Netflix’s global reach. While Netflix realized early on that OTT services would be the future of TV viewing, for many years, traditional broadcasters dismissed this idea – now it’s a race to catch up. This is also a major factor driving the search for scale in the industry. It is also important to highlight that investors are willing to pay a premium for Netflix as it is not tied to a legacy media business. On the other hand, Disney’s cable segment, in particular ESPN, continues to struggle with a declining audience which can be discouraging for investors. 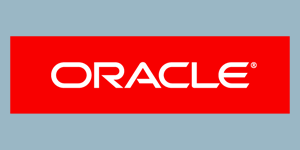 Netflix’s expertise in the OTT sector gives it a competitive advantage. For example, the company leverages data on consumer viewing habits using artificial intelligence to decide what content to produce. The production of House of Cards was decided after analyzing data on how many viewers watched political dramas, movies with Kevin Spacey and movies directed by David Fincher. Netflix knew it had an audience for the show from its data. Although Netflix is not “bigger” than Disney, there are several factors that make the company very valuable, but there are questions about whether its growth can be sustained. Netflix has a very narrow focus with limited room for revenue per customer growth and while the short-term outlook is good, the long-term poses more challenges. Disney and Comcast have more diversified businesses with different revenue streams, but both companies are currently distracted by the Fox assets. There will also be further integration issues after the acquisition no matter who acquires Fox. 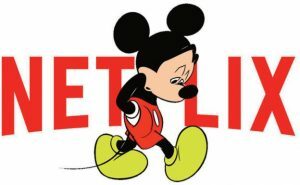 Nevertheless, Disney’s recent success with its blockbuster movies shows that its Disney-branded streaming service launching in 2019 may become a major competitor for Netflix. eSports: A New Source of Original Content? eSports, or electronic gaming, is the term used for organized, competitive computer gaming usually played by profession- als. The eSports industry has grown significantly and is expected to generate revenues close to $1bn in 2018. $655m in 2017. In 2019, Newzoo forecasts industry revenues to hit $1.1bn. In 2018, revenue will be dominated by sponsorships (40%), followed by advertising (19%) according to Newzoo. 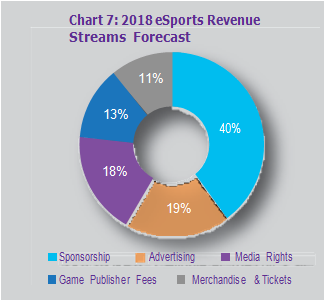 However, money from media rights to broadcast games is expected to substantially increase as traditional broadcasters and streaming platforms invest in competitive eSports as a new source of original content. In a similar way that media companies leverage sports rights to attract audiences, eSports has a growing loyal fanbase which traditional media companies can use to retain or attract new audiences, especially millennials, to their platforms. With millennials moving away from watching linear TV, companies are looking at different business models and strategies to attract this audience. eSports could be a potential answer to regain some traction among younger audiences. Although coverage was limited, 2016 was the first year that serious eSports content was broadcast – this is expected to pick up. Media giants such as ESPN and Turner are broadcasting tournaments and competitions while streaming platforms such as Amazon and YouTube have invested in gaming platforms. In 2015, YouTube launched YouTube Gaming, offering an alternative live eSports platform to Amazon’s Twitch. The platform has already created YouTube stars among popular gamers, like PewDiePie who has accumulated over 63m subscribers. YouTube Gaming was also a start-up base for now established multi-platform channels like Machinima eSports represents an attractive opportunity for traditional broadcasters and media companies attempting to dissuade subscribers from opting for other services. On the other hand, streaming services have started investing early to continue attracting subscribers to their platforms. eSports also represents an opportunity to diversify the content that companies offer to attract new audiences. IABM has recently released the first edition of its new Buying Trends Report, a biannual study tracking financial performance and trends in the media sector. This report draws on financial and survey evidence gathered by IABM as well as secondary sources to provide members a comprehensive account of demand-side trends and performance. This study can be downloaded as PDF or viewed as an interactive report on the IABM website – the interactive report enables viewers to drill down into the data. These results show that the demand side of the industry continues to go through a radical shift, with changing revenue models influencing the trends in media technology investment. 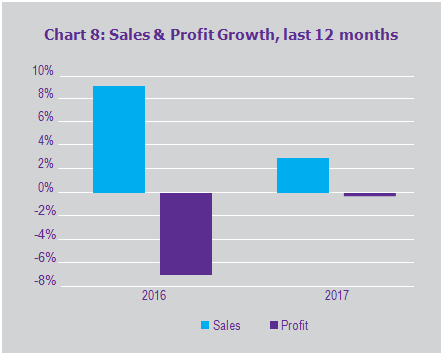 Revenue growth in the media sector worsened while profits improved compared to the figures reported a year ago. The traditional business models of this industry – advertising and subscriptions – continue to be under the competitive pressure of new media. However, our data shows that this is influencing the advertising business model more markedly than Pay-TV’s. The continued pressure on financials did not dampen optimism on the demand-side. Despite the enormous changes affecting the industry, buyers remain confident that they can successfully counter increased competition by relying on their core strengths. Multi-platform content delivery continues to be the main priority driving media companies’ technology purchasing strategy. With stretched budgets and shortened timescales, the workings of media companies are starting to resemble those of a factory, where efficiency and speed are paramount. Changing priorities have translated into a shift in technology spending that prioritizes Opex over Capex. Our data demonstrates that, although general media technology spending is growing, Capex spending is down. Media companies are requiring their suppliers to move to new business models centered on the flexible provision of software. However, demand for more traditional products such as cameras and editing tools is also strong, showing that not everything will succumb to software and IT. The shift in technology spending is prompting end- users to adopt a variety of emerging technologies to streamline their supply-chains for the multi-platform world. While IP and cloud adoption are already strong, promising technologies such as AI and blockchain remain emerging trends according to our data. With regards to immersive formats, 2018 may bring more UHD spending to support coverage of important sporting events. VR spending is likely to remain subdued although there have been improvements compared to our previous surveys. Our data shows how IT technology already makes up more than half the Capex budget that end-users dedicate to media technology. This transition to IT though presents them with some challenges, including cyber security and interoperability. Although technology priorities have shifted to new paradigms, technology continues to be at the center of media businesses’ strategies going forward. This is highlighted by several of our findings, including media companies’ increased propensity to build technology in-house, which is achieved through software development investment and/or targeted acquisitions. Suppliers are going through a profound business transformation to stay relevant to their customers. IABM members can read an article on this report in the IABM Journal as well.